I get a facebook message from my friend Chris saying this: GO PRO Opportunities? 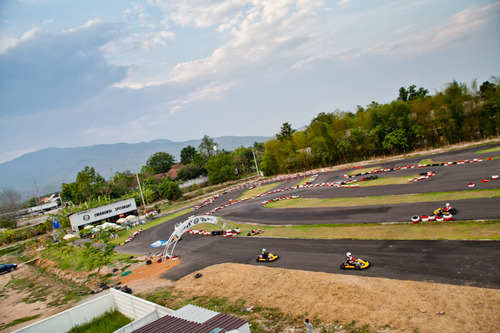 with a link to the Chiang Mai Speedkart Facebook Page. 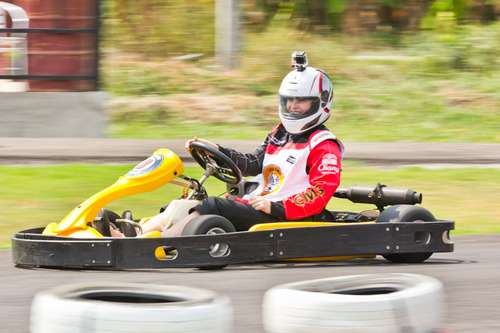 After several minutes scanning the site I thought, damn, it’s been over 10 years since I raced a Go Kart! At this point numerous facebook messages were being exchanged between Chris & I regarding a visit to the track. Each one more competitively amplified than the last, excitement building at the prospect of getting to use my ‘lead foot’ legally and put some boys to shame. I should mention that I can be a very aggressive racer and Go Karting sometimes brings out a demon desire to win at ALL costs. Needless to say, after 10 years away from the karting wheel, I was ready to unleash that sleeping demon once more. 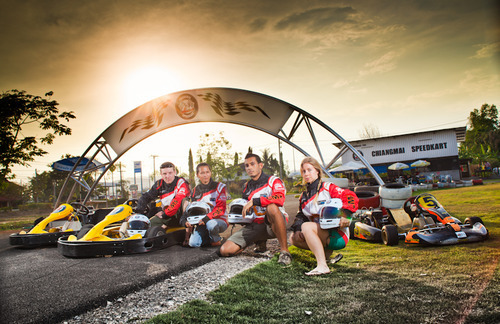 I got in contact with Kuba & Nana, the guys in charge of Chiang Mai Speed Kart to find out a little more about the track and the power of the vehicles. It turns out that each month the layout of the track is changed to keep your driving skills guessing. 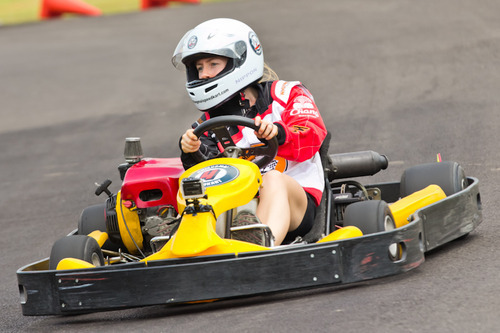 Pair that with 270cc Honda 4 Stroke Karts with Auto Transmission and you’ve got a recipe for some very excited drivers. After a few emails we arranged to hit the tarmac with 3 of our friends. 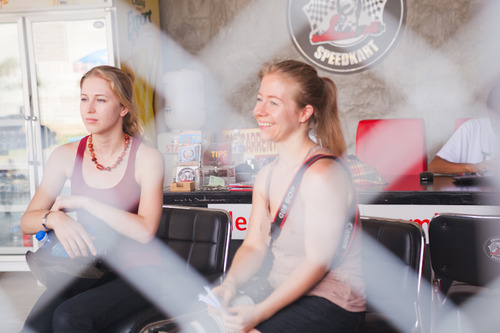 We arrived at Chiang Mai Speed Kart to a friendly welcome. Nana took a photo of us on her iPad to share on the facebook page and then we started talking with Kuba. Interestingly in this small world we live in, Kuba already seemed to know who I was. He ran to his computer and pulled up a video that he had shot from the back of a Tuk Tuk at Songkran in 2012. There I was on his video footage, firing my water pistol directly at his Go Pro lens over one year ago. We had already met without knowing it until that moment. Not long after the boys and girls arrived. Christopher & Angela Scott, authors of the blog Tieland to Thailand and our friend Ron from Texas joined the 2 of us to make up the race teams. 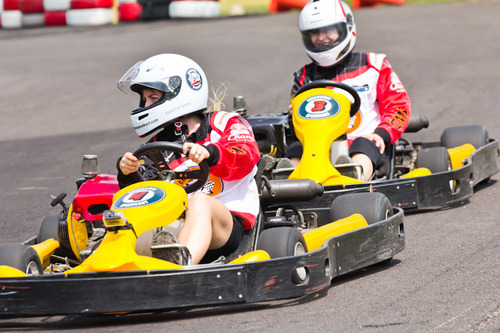 Helmets, jackets and protective clothing were provided and we set off on a bonus preliminary lap to get used to the power of the karts. It felt strange to be so close to the floor at such high speeds and we all left the vehicles trembling a little from the initial adrenaline rush. After a brief interlude it was time for the boys main event. 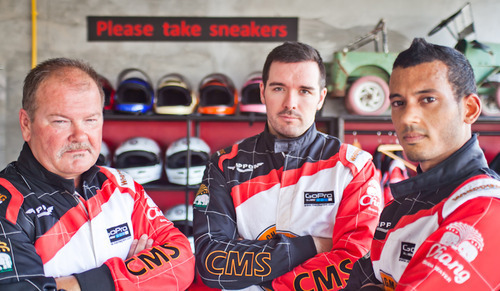 Kuba, Chris, Ron & myself wrapped ourselves in the protective clothing and sat at the starting line. Four Go Pro Hero Cams blinking little red recording L.E.Ds on our helmets. The motors were pulled into life by the staff and the race began. Within seconds the 2 heavyweight drivers Ron & Chris were falling behind, the speed of their karts inhibited by the extra kgs, leaving the track title to the feather weights, track owner Kuba and myself. I had managed to gain pole position early and intended to keep it that way, foot firmly place at maximum throttle at all times. The vibrations from the powerful engine resonating through my hands, sending an uncomfortable itch through my nerves, telling my brain to let go of the wheel. Fighting the urge to slow down I gritted my teeth and kept my pace. 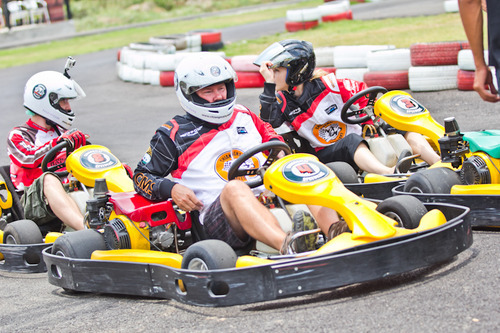 Chris’ bold competitive words now held no meaning as I saw his kart spin 180 behind us losing seconds of valuable time that he could never regain. Kuba remained close by at every turn, waiting for me to make a mistake so he could pass. But that did not happen. I crossed the finish line in first place, raising both hands into the air in victory. The next race was girls only, although it got very confusing to track who was in what position. Both ladies started at different times and there were moments when they would slow down or speed up to film each other racing. What was important was that it didn’t seem to matter. Both girls had their feet down hard on the pedals, Sacha’s concentrating squint apparent in multiple photos and Angela’s gangster style one handed driving provided some amusement. It’s probably a safe bet to say that Angela had the upper hand on the girls race, equaling one victory for the Scott Family name & one for the El-haj’s. We left the track laughing and joking about the afternoons’ races and sat by the karts to enjoy the sunny weather, re hydrating with bottles of water from the refreshment fridge. All in all our day at Chiang Mai Speedkart was a great one and we would definitely return when the insatiable desire to Race consumes us again. 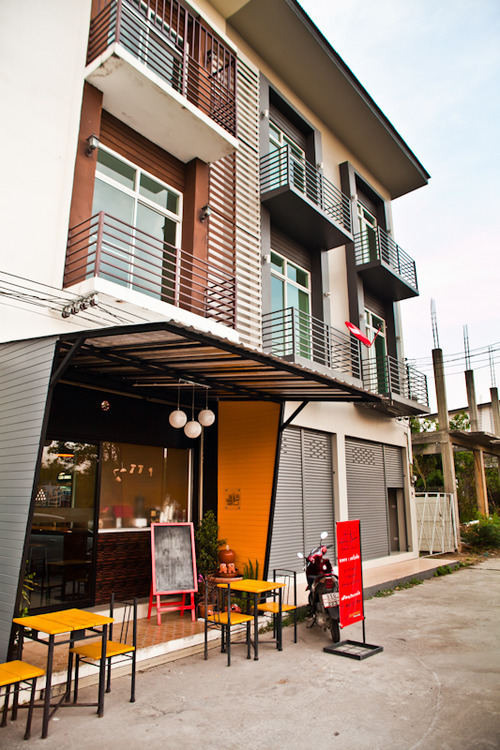 Afterwards we discovered the Racer Café, newly opened and backing right up onto the Chiang Mai Speedkart track. It’s a nice little place to eat and drink after a morning or afternoon racing. Sit inside surrounded by racing memorabilia or outside in the little courtyard garden to watch others as they whizz round the circuit. 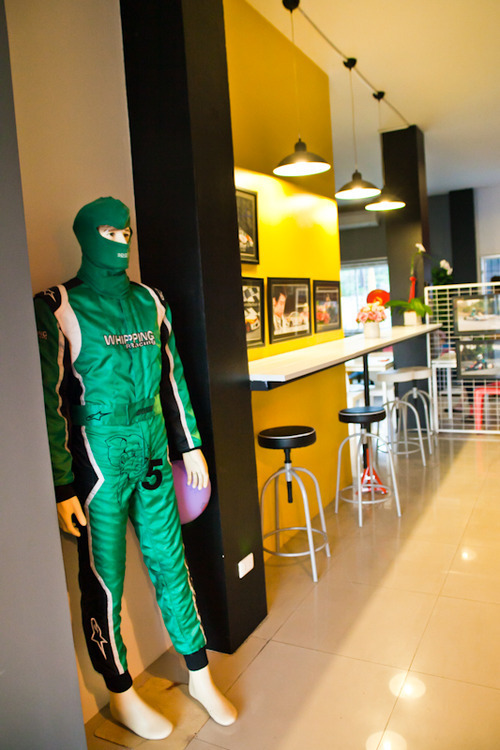 Decorated with Race Driver photos on the walls and even a full sized mannequin dressed in protective clothing, it definitely suits the theme of its location. If you ask nicely the owner ‘woody’ might even let you visit the top floor where you can see a full birds eye view of the race track to take a few photos of your friends racing. 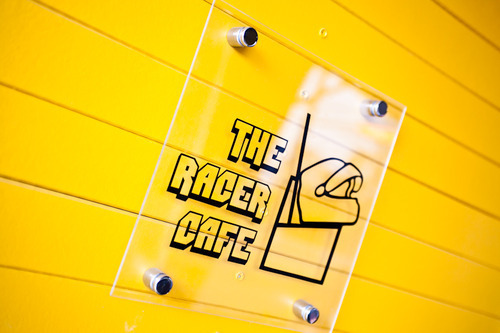 The racers café serves food and soft drinks as well as alcoholic beverages. 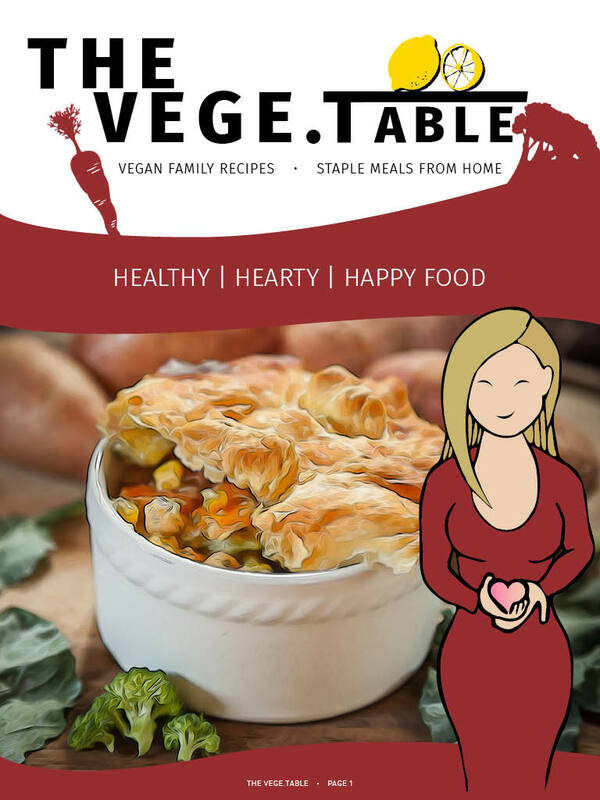 The café is open from 8am till 9pm. The Pricing system at Chiang Mai Speedkart works like this; Non-members pay 550 baht for an exhausting 10 minute race around the track. Members pay 1000 baht for a years membership and then every race becomes 350 baht for every 10 minute race. If you’re thinking 10 minutes isn’t enough, you’ll think again when you actually experience it. After the race we were all shaking and trembling with adrenaline, exertion and exposure to the sunshine & heat. It’s just the right amount of time in my opinion. There is also a premium membership option for 3999 baht that allows the user 15 free race sessions per year, followed by the members 350 baht fee for each race thereafter. 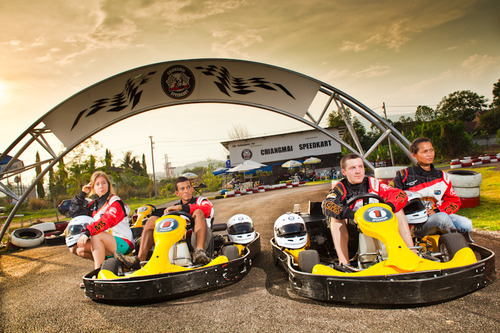 If you’re bored of old city temples and markets, need an adrenaline fix after one too many leisurely days soaking up the charm of Chiang Mai or maybe just fancy doing something a bit different, then head down to Chiang Mai Speedkart, for some Go Karting at its best. To see more photos of our Race Day Click here. 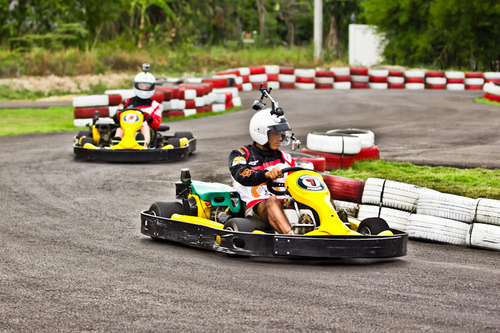 The racetrack is just 10km south of the old city, near to the night safari on Nongkhwai Road. 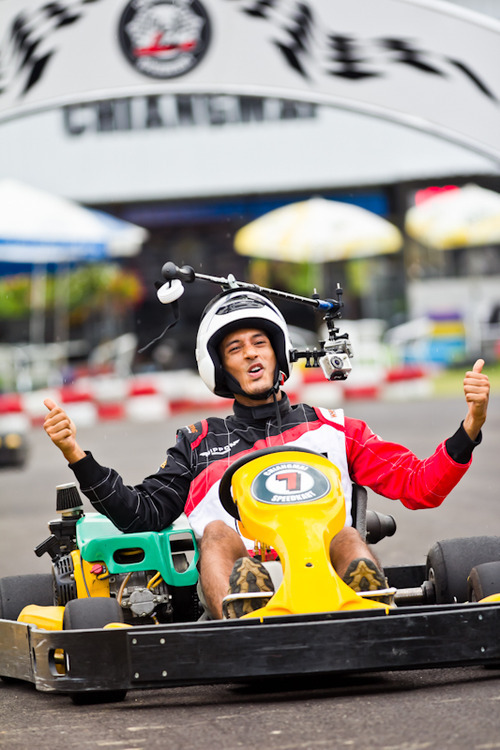 Chiang Mai Speed Kart is open everyday from 9 am – 6 pm.